The critically acclaimed Dog Vs Cat Limited Edition Hand Numbered Colored Vinyl Scratch Record, now in it’s second pressing on purple vinyl. Only 500 made! The first edition in gold vinyl is sold out. DJ Craze, Swamp, Qbert and many other well known DJ’s have two copies of the Dog Vs Cat Scratch Record. 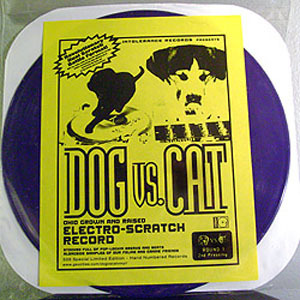 The Dog Vs Cat Limited Edition Hand Numbered Colored Vinyl Scratch Record which is produced in new revolutionary dual scratch battle format, which means that all the breaks and beats on the record are the same tempo. 120 BPM. Now, what that means is that if you have two copies, you will be able to battle the dog side against the cat side. You could also synchronize the beats because the tempos automatically align and let the animals play in harmony.